Published on November 20, 2013 by Jennifer S.
I received my first Bible as a fourth grader at the Congregational Church in South Glastonbury (yes, church, more here). I don’t remember that we had much in the way of a curriculum. Our Sunday school teachers were all volunteers, who I can not criticize as they took on a task I can’t imagine I ever would. I don’t recall learning much. There were maps in our classrooms, but I think they had been there since the wing was add to the church building in the 1960s. They didn’t seem real. The stories were just that, stories. In school you learn math, and then use it on a daily basis. But I found limited practical applications for Sunday school lessons. Last night I had dinner right near Nazareth. It’s a real place, with real people, who are all proud of their home. Frankly, it is also a lot easier to understand why Mary needed a room at the inn. That had to be one heck of a journey to Bethlehem. We were on the bus by about 7:45 ready to embark on today’s adventure. Kibbutz Misgav-Am was our first destination, where we drove along the Lebanon border. The guide told us it was easy to tell where the border is. Israel has green trees, Lebanon is gray and brown. Israel has sophisticated farming, Lebanon grows drugs. He showed us the remains of buildings that were blown up. Hartford’s north end seems like a paradise compared to this place. We met soldiers, watched them practice target shooting, and climbed aboard tanks. A few of us sampled apples from their orchards. 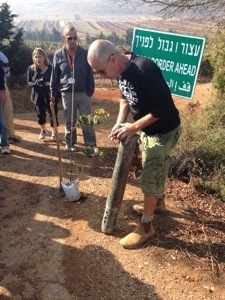 Evan had the honor of planting a kiwi tree. For show and tell the guide pulled out a Katusha missile lobbed over by Hezbollah seven years ago. Thankfully, it did not detonate (then or now). 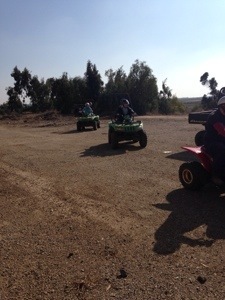 After Kibbutz Misgav-Am we continued to Kibbutz Merom Golan, the first kibbutz established in the Golan Heights. Lebanon not being quite dangerous enough, we decided to take a peak at Syria. We did this aboard ATVs and similar vehicles. At a former hospital, built by the Soviets, we took a quick snack break. The vehicle I was driving didn’t quite handle as well as my car, but the breeze was great. 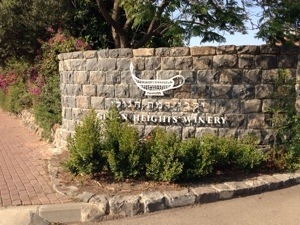 Lunch was at the Golan Heights Winery. The majority of our group seemed to prefer the Sauvignon blanc to the Chardonnay, but it was a tie between the Syrah and the Cabernet Sauvignon. The food got great marks, too. Rumor has it they sell the brand at Maximum Beverage in West Hartford. I figured that was a better gamble than putting red wine in my suitcase. Leaving the Golan, we headed to Safed for a quick introduction to mysticism. We spent a few minutes in a 400 year old Sephardic synagogue and then moved on to another activity for the soul, shopping. Few of us knew each other before we left West Hartford. Since riding the bus together for hours each day, we have found numerous connections among us. Duane works with some of my former co-workers. Amy and Al used to live on the same street. Lisa’s mother and Tracy’s mother used to be good friends. These discoveries always lead to smiles and laughter. Dinner was held at…summer camp? Bat Ya’ar Ranch is a collection of log cabin buildings. It is a horse farm, so more than one of us wondered where the steak came from. After dinner we participated in a drum circle. At one point or another we all hit the dance floor, even Al, who at 86 wins the chronological age award on this trip. Eric pulled me onto the floor during the hora. From kiwi and Katusha missiles to horses and hora, it was quite a day. Particularly the morning portion is something most of us never dreamed we would see. Most were in awe of the dangers the soldiers face daily to keep this beautiful country safe.